The most basic function of any sales manager is to make sure that their sales team is doing the things that they need to be in order to be successful. Sales managers should keep their eye on certain statistics that will give them valuable information about the performance of their team. These statistics can range from activity tracking, response time, sales tactics, using internal resources and rate of closing. A high outbound call volume makes every sales manager happy. Making a lot of dials doesn’t necessarily lead to success though. What happens after the first call? Does each sales rep schedule a follow up activity? What is their ratio of call to close? How many contacts does it take to push a lead forward? If your sales teams activity levels are high but the sales numbers are still low; it might be time to make some changes. Maybe the team needs help identifying and getting through to key decision makers. A CRM with a built in organization chart can help. Maybe the sales manager needs to put in a call to the decision maker to help things progress but if that person isn’t identified correctly, then it can’t be done. When a lead is assigned to a sales rep, how quickly do they make contact? We live in an on-demand world and prospects operate at that same speed. If they submit an inquiry they want a response almost immediately. What tools does your company have in place to ensure prospects aren’t sitting around waiting on you? A CRM system with an integrated web to lead capture form is a huge time saver. A lead comes in, is automatically assigned to a rep and appears right on their dashboard so they know they have to work it. What could be easier? This also allows a sales manager to track when the lead came into the system and when the rep made the first attempt at contact. As we all know time is money and if your prospect is waiting on you chances are they are already looking at your competition. When a prospect shows interest in your product or service and requests pricing information, the sales team should immediately be entering a sales opportunity into your CRM system. When an opportunity is identified and properly placed in a sales pipeline; the real selling begins. What is it going to take to close the deal? When is the opportunity expected to close? Have you worked with this customer before? Have you worked with another company in the same industry? The questions are easily tracked in any CRM system that has a customizable sales pipeline and a spot to put in competitive intelligence like industry. Using a CRM tool with this capability will allow your sales reps to have the information at their fingertips and transmit a stronger value proposition to the potential buyer. The sales manager is then easily able to track what type of information the most successful sales reps are using and to identify vertical markets that your company is strong in. What resources do you have at your disposal to use in helping your sales team close business? The best sales managers use every tool at their disposal to empower their sales reps to close business. One of the most overlooked aspects of sales is the function of marketing and sales working together. Marketing isn’t only around to brand your company or get your message out to potential new leads. Does your marketing team do case studies? Do they keep a list of customer testimonials? Do you have whitepapers and videos that support your value proposition? Most importantly; does your sales team know these tools are available to them to use while engaged with a customer. A CRM system that has a document library feature is a great place to house all these resources. Sales managers often use these document libraries to pick and choose the most valuable bits of information to place in front of their team. As a sales manager it is vital to identify which sales reps are the best closers and help the ones that aren’t closing as effectively to improve. Sales managers without a CRM system have to rely on reports and cumbersome excel spreadsheets to identify this. A CRM that has a win/loss analysis metric broken down by person provides statistics on who may need help with their closing skills. The sales managers can then work with them on the closing process and help them to improve. 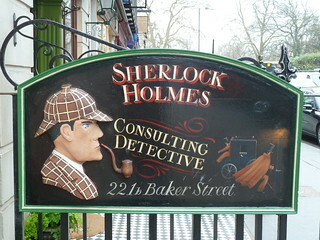 Image “Sherlock Holmes Museum” by givingnot@rocketmail.com on Flickr under Creative Commons license. ← Sales Question and Answer #23 – Which sales magazines and sales improvement seminars do you recommend?